There's a story to record about Alonzo Grant Taylor that warms hearts. In Liberty Grove Baptist Cemetery there is a special memorial placed to honor a little girl and Alonzo's kindness. The girl's last name was Gardner. Her first name is unknown. 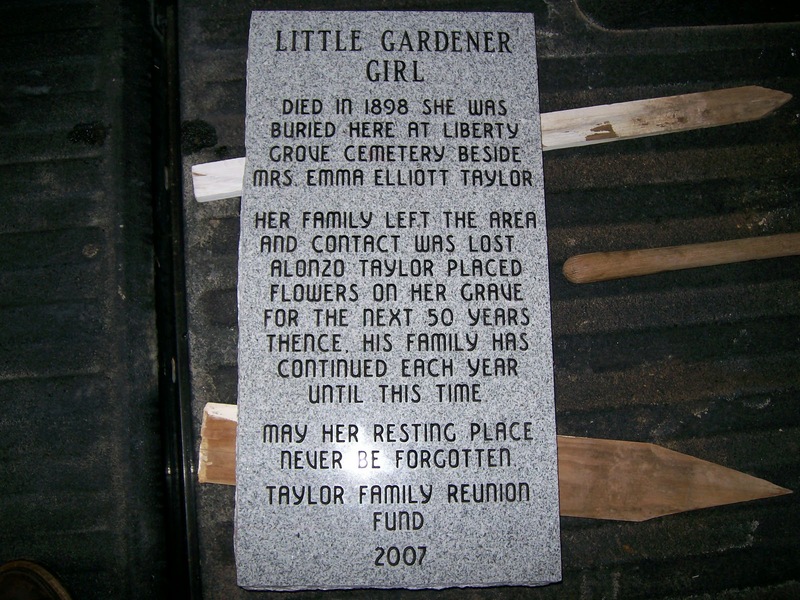 The Little Gardner girl died in 1898. She is buried next to Alonzo's first wife, Emma (Elliott) Taylor who also died in March of the same year. 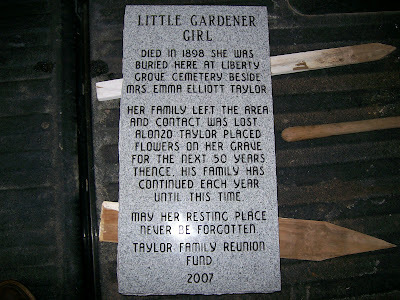 A small primitive tombstone was placed at the little girl's grave, most likely by her family. Shortly after the little girls' death, her family moved on to live elsewhere. No details about the Gardner family are known. For the next 50 years, during the church's annual decoration day, Alonzo would always bring flowers to place on the little girl's grave. She was never forgotten. In 2007, members of Alonzo's family arranged for a permanent memorial to be erected on her grave, to commemorate the Taylors always remembering ...what Alonzo never forgot. May we all show long lasting acts of kindness and respect, as Alonzo displayed for over 50 years.